I eat a lot of salads. I LOVE salads. The bigger the better. But not all salads are created equal, and the ones I stick to are usually the healthiest, the ones that would probably bore the grand majority of America: dark leafy greens, loaded with tons of veggies (beets, especially! ), a hard boiled egg for protein, lightly salted pumpkin seeds for extra crunch, fresh herbs like parsley, and scant dressing. I seldom order salads at restaurants since most of them bear no resemblance to a healthy salad. But sometimes you just want to, as Elaine from Seinfeld would say, dive into a Big Salad. So I construct my own, and thereby get to control exactly what goes into it. I am a paragon of healthy salad eating, am I not? No. I'm not. Not really. Because here's what's been taking up residence in my head since early summer when salads are better than ever thanks to fresh produce: a salad with FRIES on it. And not just any fries. CHEESE FRIES, y'all. Let me explain. I grew up in a wonderful planned community that was situated right on a gorgeous lake. My house was a 15 minute walk to that lake, and right next to where all the boats were kept was a restaurant called Sunday's. I loved biking to Sunday's with my pals for ice cream or cheese sticks when I was a kid, and going to Sunday brunch with my family. But when I was a teenager and into my college years, one of my favorite things to do was have lunch with my mom there on warm Spring and Summer afternoons, sitting on their sun-dappled deck overlooking the lake. And our favorite thing to eat during those lunches was a really big salad. Imagine it with me: fresh, crisp lettuce; ripe tomatoes; blackened grilled chicken; and fries smothered in cheese. I don't know who the genius was who decided that cheese fries belonged on a salad, but we wanted to shake their hand heartily and possibly build them a shrine. The cool freshness of the veggies, the spicy kick of the blackened chicken, and a light Honey Poppyseed Dressing all worked with the decadent, sumptuous cheese fries. Salty, spicy, sweet. Tender and crisp all at the same time. It was a bowl full of contrasting textures and flavors that all mingled perfectly somehow. To this day, it's the one salad that has stuck with me because of how delicious it was. Sometimes I have been known to order a salad at Chick-Fil-A and sneak a fry or two from my kids, and shred it into a (mostly) virtuous salad. But I knew I could do better. I had to reconstruct my favorite dish from so long ago. So I brought a whole mess of ingredients over to my mom's house this week to attempt it. There were definitely some things I wanted to switch up from that original salad. The first is that I really don't like blackened anything. Not only do I not want to eat it anymore, I don't want to make it either. So right away I had to figure out what would account for the spicy factor. I wanted to throw the chicken on the grill but we've been rained out since last Friday, so that was out of the question. I bathed some chicken breasts in a spicy mesquite BBQ sauce, and baked them on 350˚ for about 30 minutes so that they were super juicy and tender. I decided to make the star of the show - the fries - a little healthier by buying a high-end brand of baked, nearly fat free fries. I baked them according to the directions on the package and then at the very end hit them with some freshly grated colby-jack cheese. The dressing I used was - gasp! - bottled Honey Poppyseed Dressing. Yes, fellow Gourmands. I used bottled dressing and packaged french fries. I can feel the disappointment rolling off of you as you read those words. And I'm ashamed (I'm not, really, but I have to say that to protect my image). The salad was the BOMB. It was fantastic, and definitely fulfilled my nostalgic jones as my mom and stepdad and I munched on this most unvirtuous of salads. If I had to do it again, I'd lightly brush the chicken with vegetable or canola oil, and dust it with a bit of Creole seasoning like Tony Chachere's before grilling it. Or I'd switch the cheese up to a Pepperjack to bring out that spicy component that was missing. That's the beauty of this salad though - you can literally do whatever you want with it to make it your own. Just don't forget the cheese fries. 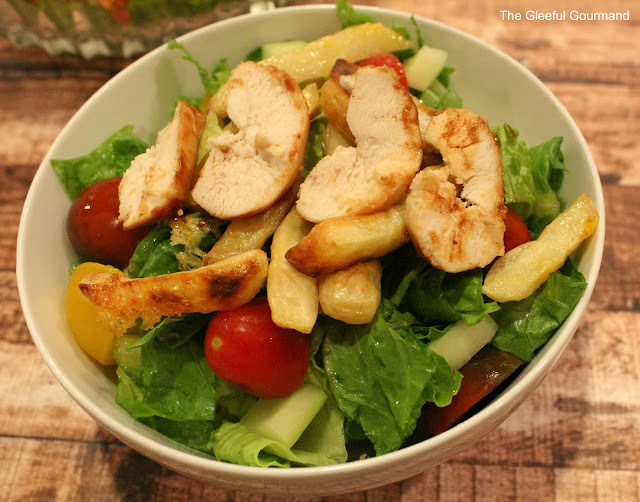 Assemble salad except for fries and chicken. When the fries are just about done, sprinkle with shredded cheese and bake for about 5 minutes longer. 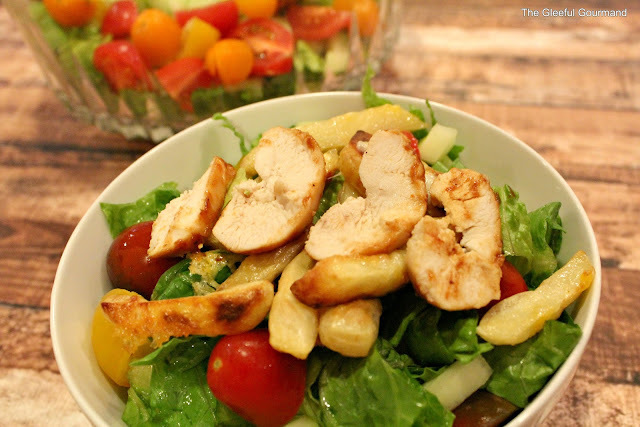 Cook chicken to your liking, then slice thinly and place on top of the salad. Serve. Eat. Swoon. Repeat.